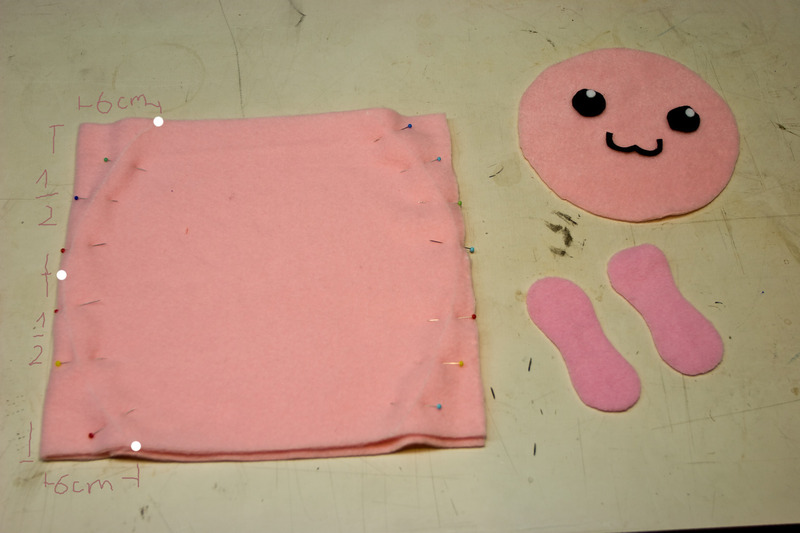 What you’ll need: pink fluffy fabric, a bit white and black felt, (matching) pink thread. Now you’re good to go! Here’s the pattern . Cut out everything. These are the bottom and the top ball pieces. How the face will look like. Cut out a 25 (height) x 54 (width) cm piece from your pink fabric, fold once (right sides facing). Between the white dots drawn, draw a curve, not too close to the edge because that's where you'll be sewing next. Do that for the left and right sides. Use pins or don't. The top one shows how it's supposed to turn out, already turned inside out and stuffed. Start like shown and sew along the edge (just how a tennis ball is made). I forgot: don’t sew *all* along the edge. Leave a little bit open so you can turn it inside out. Stuff it but don’t close it yet! Halfway done with the body. Ok, not yet. Grab the open hole and fold again. Draw the same curve for the two sides left and sew. You may close this thing (no need for leaving it open since we’ll cut it anyway). Measure 8 cm from the bottom tip and draw a curve like shown above. Pinning the bottom part onto the body. Don’t be too precise because the bottom piece is somewhat too big. Sewing on the botton is the most annoying part (remember to leave a bit open!). Look how crappy it turned out here 🙁 Luckily, it won’t be too apparent on the finished product. Turn it inside out, stuff it (take your time until it looks good) and close the body with the ladder stitch. Sew on the top ball with a few stitches so it won’t come off. Start inside the ball so you can make the knot on the end of your thread as big as you like. Close the ball afterwards. All that’s left is glueing on the face! Arrange it before you try to glue so you can be sure to like how it turns out. The mouth is very fragile. Be careful or you have to cut it out again (which is a pain too!). Thanks for showing us how to make a Poring! I\’m planning to make one for a dear friend of mine. Lets hope it\’ll turn out well! There seems to be several steps missing or noted not explained, making the body is very confusing. could you clearify a bit which part exactly it is you find confusing? As i find the explainations quite clear (i sewed a few after all) i cannot make out which part exactly is underdocumented. Late, but you\’ve got mail….